-Colouring maps of Canada, including drawing Scout Kid’s house and Grandmommy’s house, not to scale. -Singing a song of the provinces that my mum invented for us years ago, slightly modified to fit in Nunavut because when I was your age there was no Nunavut. I might make a video of Scout Kid and I singing it sometime, once he learns to actually say the words instead of humming along in nonsense-language. 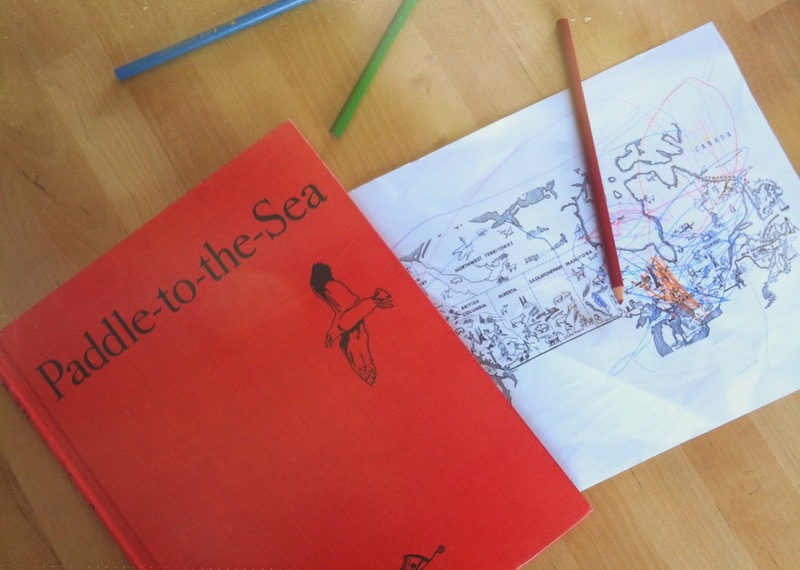 -Reading Paddle-to-the-Sea and tracing his route along the maps we had coloured. -Zooming in and out on the satellite view of Canada on Google Maps. We talked about how the different colours meant water, trees, rocks, snow, mountains, and fields, and I showed him our house, and Northern Canada, and Hudson Bay and the Rocky Mountains. *Disclosure: book link through my Amazon Associates account.